Are on Devon right now. at Patel Bros.
$36 for a case of 12, they were packed 5/14 in India and must have been harvested a little unripe - my case isn't ready yet. They were selling very fast, folks walking out with 3, 4 cases. season normally last about 4-6 weeks or so. Don't know if the price will come down as novelty wears off, but I'm told that air freight on the case works out about $18, and they are relatively expensive even in bombay, so I don't think they'll come down that much. The first mangoes of the year make newspaper headlines and herald the coming of summer. Mangoes start trickling into the markets by mid-March and are usually picked up by customers who do not mind spending a packet on it as its cost ranges from Rs 400-500 a dozen. I hadn't known about this phenomenon. I am eager to get myself a case of those delicious mangoes. NPR also recently had a story about the lifting of the Indian mango ban. 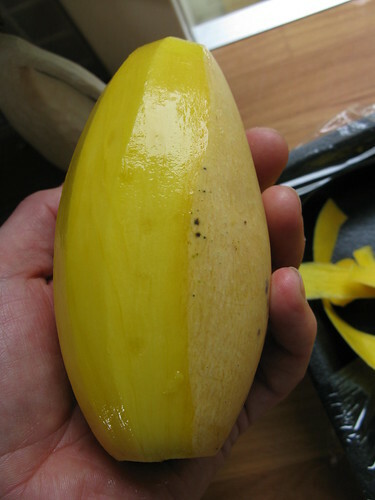 eatchicago wrote: NPR also recently had a story about the lifting of the Indian mango ban. I heard the NPR story, the oddest question I thought was - "what do you make with them?" The guy was too polite to say - they're fruit, you eat them. I was just at Patel (reminder to self: NEVER again go on a Saturday afternoon) and my case of 12 went for $25. How were the mangoes? I would be curious to hear how they compare to Alphonso mangoes eaten in India in terms of freshness, flavor, etc. I was skeptical if they'd actually be noticeably different from other mangoes...but all the descriptions you read about them (smooth, sorbet-like, fragrant, sweet, rich, juicy, etc.) were spot on. They were extremely sweet but with a nice note of acidity what I can only describe as a super-concentrated mango flavor. Also, the texture was stand-out: velvety and flan-like with absolutely no obstructing fibers making a spoon my weapon of choice. The fruit is surprisingly juicy, with the nectar pooling where my spoon just dug out the meat and happily dribbling down chins and fingers. In addition to the flesh, the pit itself is a treat...slurping as much of the the remaining sweet-sour pulp from the fuzzy seed as humanly possible. The best $25 I've spent in a while. I bet they were actually Kesars, not Alphonsos -- check the box. The Alphonsos seem to be all gone as of about a week ago. Still, a relative bargain for a great mango; I'll try to grab a case this week. Thanks for the heads up. You're absolutely right....they were Kesars! In all honesty, I didn't know that there were multiple types of Indian imports. I kind of took it for granted when I asked the store clerk "Where are your imported Indian mangoes?" that she'd direct me to Alphonsos. Before I picked up lunch today at Khan BBQ, I stopped in at Patel Brothers and asked about Alphonsos. I was told that they are finished until next year. This pretty much lines up with my professional experience, in which I deal with Alphonso mango puree. It is a VERY short season. They have always had the puree in big old cans up at the markets on Devon. It may be canned, but it is still excellent. Chill it down, mix with a touch of corn syrup and a touch of lemon juice, pop into your ice cream maker, and it makes stupendous sorbet. leek wrote: They have always had the puree in big old cans up at the markets on Devon. It may be canned, but it is still excellent. Chill it down, mix with a touch of corn syrup and a touch of lemon juice, pop into your ice cream maker, and it makes stupendous sorbet. At my work, we sell industrial-sized quantities of Alphonso Mango Puree and it rates very highly among those who've actually eaten fresh Alphonsos. Generally speaking, it goes into products that are not cooked and in which there are a minimum of other ingredients used (ice creams, sorbets and smoothie bases). Last year I gave my Indian friend a case of the stuff and he made ice cream out of it and served it at his restaurant. He was impressed that even after processing and pasteurization he could still immediately sense the 'Alphonso' note in the puree but he also conceded that it wasn't quite as pronounced as it would be in fresh product. When are the mangos due in this year? The Alphonsos are back. Patel Brothers has them for $30.66 for a case of 12. The Kesar mangoes are due soon. It seems too early for alphonso mangos and, in a sense, my Indian friend confirmed that it is. He bought a few cases at Patel Bros last week and felt they'd been picked way too early. Some fruits ripen well after picking but mangos generally don't. According to him, after a few days, the fruit softened but it never displayed the characteristics (color/aroma) that typically distinguish alphonsos. His wife, otoh, who is American, thought they were just fine and enjoyed them. ronnie_suburban wrote: Some fruits ripen well after picking but mangos generally don't. According to him, after a few days, the fruit softened but it never displayed the characteristics (color/aroma) that typically distinguish alphonsos. In India, the intense heat can sometimes cause ripe fruit to spoil before there is time to consume it. 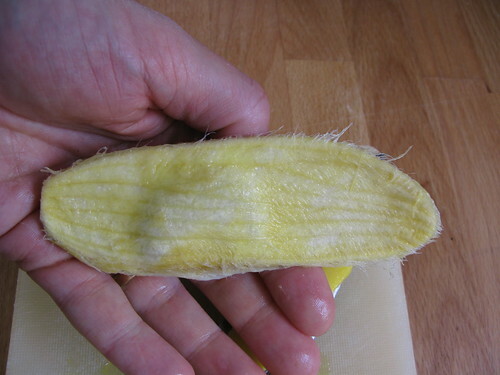 As such, fruit is frequently purchased when it is not quite ripe. 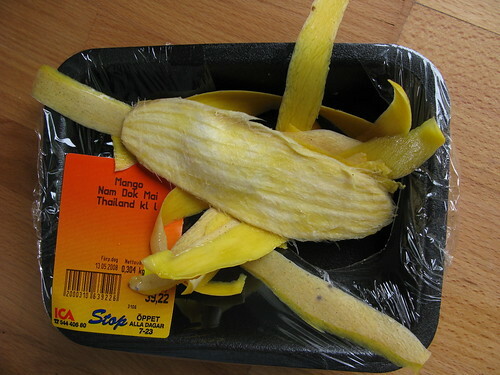 Mangoes are wrapped in newspaper and left to ripen. In India at least, this method seems to work well and does not negatively impact the color and/or aroma. Well, I'm certainly no expert; just wanted to relate my friend's disappointment. FWIW, this shipment is more than a month earlier than last year's shipment to Patel Brothers. ronnie_suburban wrote: Well, I'm certainly no expert; just wanted to relate my friend's disappointment. FWIW, this shipment is more than a month earlier than last year's shipment to Patel Brothers. Indian mango newbie here. Will Patel Bros. get another shipment, or should I go stock up now? My wife and I have been talking about buying these for three years but have never pulled the trigger. The Ashland Whole Foods has a few featured new mangocentric items in the prepared foods case. I took home a container of the Grilled Mangoes with Raspberry and they were delicious. I am working my way through one of the early boxed of Alphonso Mangos right now and I am a bit disappointed. I had pretty high hopes for these. When I was a kid, we would spend 2-3 months in India at a time, usually over summer break. I hadn't developed much of a palate for Indian food, so I would subsist for two months on mostly mangos. I especially loved the Alphonso and would eat mango or mango pulp at every meal. Although tasty, these don't really compare to the mangos of my youth. 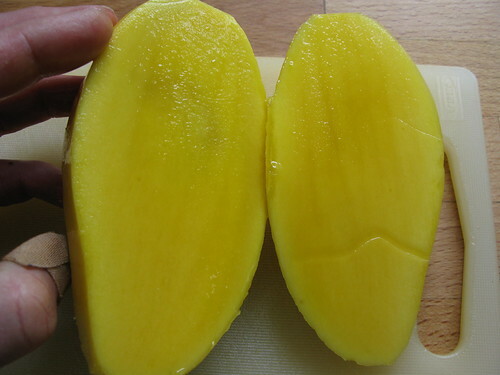 They are decent indian tasting mangoes, with a fleshy skin, alluring aroma, and sweet mango taste. In my estimation, just a tad smoother with a fruitier aroma than the much cheaper marathons. These are better than those mangos, but not as good as the ones in India. Whether they are worth 7$ a fruit is a personal decision - but next time, I'll stick to the marathons. ronnie_suburban wrote: FWIW, this shipment is more than a month earlier than last year's shipment to Patel Brothers. Just checked with my sister in India and, you are correct, Alphonsos are just now entering the markets in full force. Well, tell her to send us some! Funny you say that. When I asked the question she immediately asked if she should send me some and I sad "Not necessary." Mmm a case of varied Indian mangoes is making me drool. I may need to call her back! 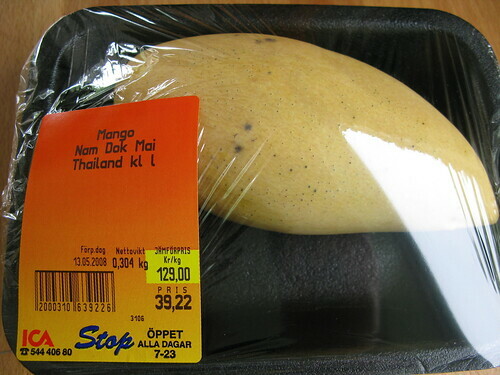 I've seen a couple of boxes of Alphonso mangos in a few Stockholm markets lately but today I stumbled upon a few Nam Dok Mai mangos. Extremely sweet, extremely tender, dripping with juice and mild in its "mangoiness"*, this was mango heaven. which does a pretty good job, but man! it's *nuthin'* like the professional job you do on your mango. How DID you do that? Tell all! 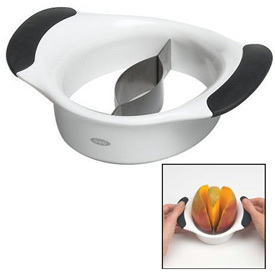 I'm glad I'm not the only person who owns one of those mango cutter thingies. My friend who always give me kitchen gadgets gave it to me one year. I like the idea of it, but it's been about as useful to me as the MoMA whisk that the same friend gave me on another occasion. 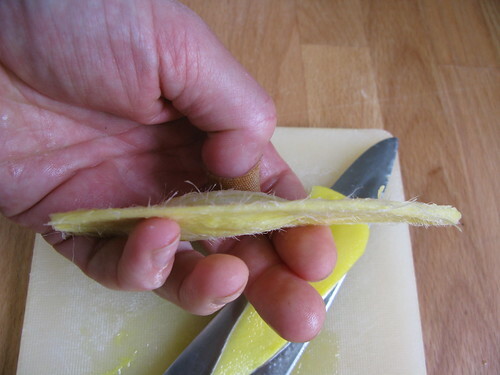 The cutter hasn't been helpful at all with smaller varieties of mango or mangoes with oddly positioned or shaped seeds. 3) noisily slurping any remaining molecules of perfectly ripe mango flesh as juices drips down your arms. I did give the pit a quick rinse before taking the shots, too as I was impressed by the thin pit. Also, I suspect that this species of mango doesn't hold so jealously onto its flesh as very little seemed to stick to this pit. I certainly planning on buying a few more (despite the 8 dollar price tag) so I'll report back if I notice anything different. I hope you won't interpret this in any way other than the utmost compliment that it is, but I'm so glad you scrape with your teeth, slurp noisily and get sticky arms, too! Your posts (and kitchen) are always so beautiful and NEAT. 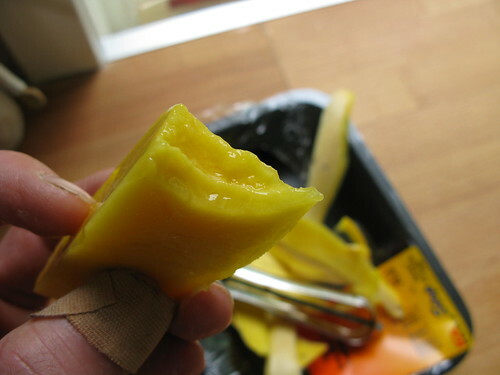 Even with the most specific of instruments--the OXO mango cutter that Geo mentioned or a very good paring knife--eating mangoes for me is always a messy, messy affair. It makes me feel better that you've got a little messiness in you, too.